While I was in Houston getting Mario Williams and JJ Watt at the Community Player of the Month event, I figured if I might be able to square away another name while I was down there. It came down to Owen Daniels and Jacoby Jones, but with me having frozen to death outside for JJ and Mario, I opted for Owen knowing that the line would be queued inside the store. Following another fan to the Go Texans store in Reliant Stadium during rush hour I got to the store a few minutes after the event began and surprisingly was able to get him twice. The first time I came around I was a bit too starstruck and just honestly didn’t know what to say to Owen. The event was definitely more intimate than the cattle call of the Whataburger event and it was just an awkward exchange. I told him I’d come around again, and when I finally did I told him that I was happy the team was able to lock him up for a few years, and that I consider him bionic because of his 3 knee surgeries. Daniels was very gracious and looked me in the eye after knocking on wood (about the knee surgeries), and thanked me for driving from Austin to visit him that day. 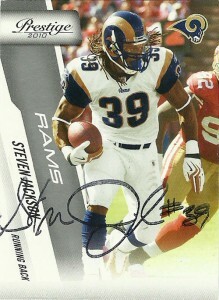 Looking at these cards, I liked where Score was going with their look from 2009 to 2010, but they totally lost it in ’11. Still the thing I can appreciate most about this set is its level of coverage of players as there seems to be a nice balance of offense and defense. I wasn’t too enthusiastic about the lineup of Prestige cards. The Texans’ logo looks like it’s about to attack Owen’s shoulder and the metal look has been done and over done along with that annoying fade. I do however like this card in particular as it seems well suited for the set, especially Owen’s pose silhouetted against the design and certainly the autograph took well enough. 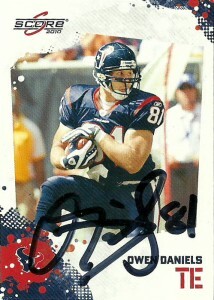 Daniels in 2011 is off to his best season since 2008 when he recorded 70 receptions. 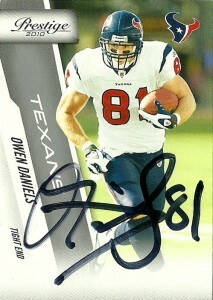 After a slow week 1, Owen has recorded at least 3 receptions in each contest through week 13 of 2011. 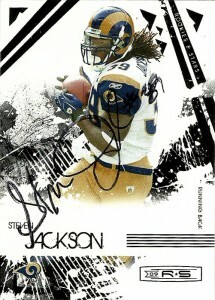 He’d have season highs in week 5 against the Raiders with 7 receptions for 89 yards. 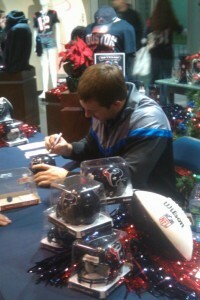 An integral weapon to the Texans play action system, Daniels also serves as the team’s emergency quarterback.